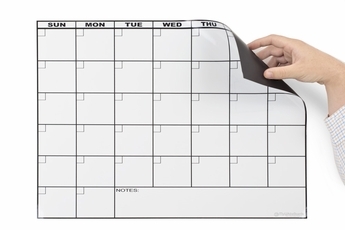 Our magnetic refrigerator calendars are a strong magnetic dry erase calendar that sticks to any magnetic receptive surface so that you can keep track of your families hectic schedule right where everyone is sure to see it, The Fridge! 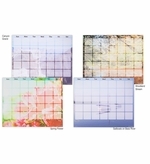 These 30 day fridge calendars offer an ample amount of room in each day so that you can write in all of your pickups, drop-offs, sleepovers, meetings, appointments and everything else that your family needs to keep track of. These kits include a 17"x22" calendar, Opti-wipe microfiber cleaning cloth, 4 large magnetic marker holder rings and a set of 4 chisel tip dry erase markers! 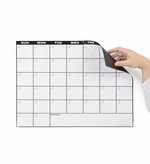 17" tall x 22" wide, Magnetic 30 Day Calendar. Markers included. 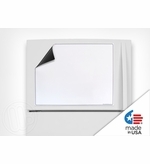 17" tall x 22" wide magnetic sheet with an awesome dry erase writing surface.